TRINITY NATIONAL WILDERNESS, Calif. -- Two miles from any trail, 40 people scramble down a steep incline. They are going to dismantle a marijuana-growing operation, and they have a helicopter to meet. The operation is quick and dirty. They step up to a 7,800-gallon cistern, formed by logs and dug-out earth, and clip wires holding the logs in place. A Pave Hawk helicopter, courtesy of the California Air National Guard, descends partway and drops a load of six nets. The crew -- made up of law enforcement officers from state agencies and volunteers from local environmental groups -- assembles bundles of trash, including irrigation pipe, tarps, buckets of fertilizer and rodenticides, propane tanks, and assorted junk left behind from three people's six-month stay. One hour later, the helicopter comes back into sight, its blades scattering forest debris. It lowers a hook and carries off the trash in two passes. The operation, which took place in October 2014, was part of a one-off program funded by two grants from the Fish and Wildlife Service. Over the course of a week, the team dismantled seven similar "grow sites." They amount to a tiny fraction of the thousands of marijuana farms scattered across public lands. 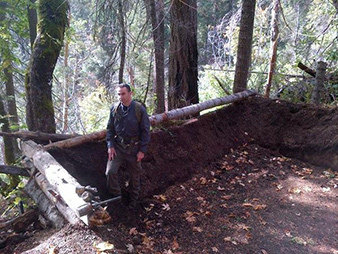 Mourad Gabriel, an ecologist and organizer of the raid on the Trinity Wilderness area pot farm, stands in what's left of its 7,800-gallon cistern. Photo by Debra Kahn. Growing marijuana triggers a host of environmental problems. Chief among them is its clandestine water use. Then there is the application of rodenticides, some of which are banned in the United States, and others of which are only for use in the built environment. Many of the other items rounded up can also be hazardous to wildlife. Baling wire, strung between the trees to dry the marijuana, cripples eagles that fly into it. Raising awareness of the hazards of illicit marijuana farming is hard in Trinity County, where the local economy revolves around marijuana and the radio airs advertisements for Northern Roots, an "indoor gardening and hydroponics" supply store. The same can be said for many parts of Northern California where the bulk of California's estimated 50,000 marijuana farms are located, according to numbers from the State Water Resources Control Board (SWRCB). Most residents think of marijuana as innocuous, even though its environmental effects are clearly damaging. Modern-day marijuana operations belie the stereotype of gentle, hippie pot growers. They scour maps for water sources and even pay wildlife hunters to log any water they come across on GPS devices. They raze forests and create roads, shoving thousands of pounds of sediment into nearby water sources to the detriment of salmon and steelhead. The growers at this site had dammed a small creek that leads to the Trinity River, diverting it into the 7,800-gallon cistern. At another site, growers had strung hot dogs laced with poison around the plants to kill any predators that happen to eat meat. "Marijuana is really grown in the hidden corners of California in large part due to its quasi-legal status," said Jennifer Carah, a biologist with the Nature Conservancy. "We're in a situation where we produce a ton of the stuff, and we're producing it in a place where water is limited." Bolstered by the passage of the Compassionate Use Act in 1996, which legalized the use and limited cultivation of medical marijuana in California, over the past two decades the state has experienced a marijuana cultivation boom. The extent of the clandestine marijuana "grows" is unknown, but one of the members of the October expedition, Integral Ecology Research Center Executive Director Mourad Gabriel, said he has learned of 1,200 on public lands in the past two years alone. "Few people fully recognize the vast scope and scale of illegal trespass grows," said Nick Goulette, executive director of the Watershed Research and Training Center, a Trinity County-based nonprofit. "We're only just beginning to count the ecological costs, and at a moment when climate change, drought, private water demands and wildfire are pushing ecosystems and species to the brink." In the eyes of the federal government, marijuana remains a Schedule 1 controlled drug, which means it has no accepted medical use. Other Schedule 1 substances include methamphetamine, heroin, Ecstasy and LSD. But while its legality is murky, what has increasingly become clear to officials is the damage created by an industry that still remains in the shadows. But that may be changing, at least in California. Last Friday, a package of bills to fully regulate medical marijuana hit Gov. Jerry Brown's (D) desk, which includes environmental rules for its cultivation and funding to rehabilitate grow sites. 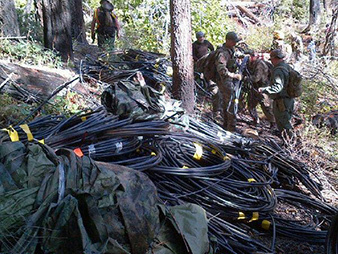 Volunteers gather up coils of plastic pipes, illegal poisons and other debris at the Trinity Wilderness "grow" to load them onto an arriving helicopter. Photo by Debra Kahn. "Our environment and our communities have been paying the price for the state's lack of action over the past 20 years," said state Sen. Mike McGuire (D), the author of the primary bill. He represents the North Coast region, where most of the country's marijuana is grown. The bill instructs the state Department of Pesticide Regulation to write standards for the use of pesticides in growing marijuana and the maximum remaining residue allowed to be left in the end product. Three other agencies will outlaw water use that affects fish that are migrating through, spawning in or living in rivers. It also sets a deadline of 2020 for the state to create standards for organic certification. A companion bill, A.B. 243, directs the California Department of Fish and Wildlife (CDFW) and SWRCB to make permanent a year-old joint task force that addresses environmental enforcement, and authorizes them to increase the cost of stream diversion permits in order to fund remediation. "This legislation is an important first step in cleaning up the mess created by free-for-all marijuana production in one of the most environmentally sensitive corners of California," said the director of Sierra Club California, Kathryn Phillips. It's unclear what the effect will be on farming that takes place on public lands, however. Since those operations are the most illegal, they're also the least likely to submit to regulation. Goulette noted that most of the medical marijuana is grown on private farms. "I'd wager that none of what's grown on public lands flows into the medical market." It's estimated that California produces roughly 60 percent of the marijuana consumed in the United States. The Nature Conservancy puts the overall value of marijuana cultivation in the state at roughly $16 billion. A large percentage of the grow operations are centered in Mendocino, Humboldt and Trinity counties -- or what's known as the Emerald Triangle, the largest cannabis-producing region in the world. In Humboldt County alone, CDFW estimates there are about 4,000 grow operations. "We have grows that are larger than ever," said DeWayne Little, a lieutenant with CDFW's Watershed Enforcement Team, speaking during an informational hearing of the California State Senate Joint Committee of Fisheries and Aquaculture in July. "Streams are being diverted at an alarming rate." Last year, CDFW and SWRCB launched a Marijuana Task Force. The program calls for the creation of a regulatory program for cannabis activities, conducting targeted enforcement and doing outreach in local communities. It has the power to investigate illegal water diversions and police water quality. So far, CDFW's enforcement team has visited nearly 100 grow sites and has issued one fine totaling $300,000, five cleanup and abatement orders, and a number of minor violation notices, said Thomas Howard, executive director of SWRCB, speaking at the July California Senate hearing. That has been considered a success, Howard said, but the level of enforcement is barely scratching the surface considering how many farms are suspected to be unregulated. A report earlier this year from the task force found that marijuana cultivation has been worsening the effect of the drought on streams that are home to salmon and steelhead. It identified 24 streams in Northern California that went dry last year due to the combined effects of the drought and illegal diversions for marijuana. Last month, the North Coast Regional Water Quality Control Board (NCRWB) adopted California's first regional water quality regulation to protect the environment from discharges of waste associated with cannabis cultivation. Beginning Feb. 15, 2016, growers with sites of 2,000 square feet or more are being asked to enroll their properties. They can opt into one of three tiers -- ranging from low threat to in need of cleanup and restoration -- depending on site conditions and threat to water quality. Matt St. John, executive officer of the NCRWB, said over the last 10 years grow operations have exploded in the region. Years of comment from the public on the problem prompted the board to take action. "Let's all be clear, marijuana cultivation in the North Coast has been a big part of the culture and the economy going back many decades," St. John said. "Really the passage of the Compassionate Use Act that made it so more folks were converting timber land to put in grow pads." He said the board "thought very carefully" about how to write and implement the order. It consulted with the Department of Justice and Governor's Office and received, "while not formal buy-off from the federal DOJ, we've gotten verbal concurrence to proceed." The order also allows approved third-party programs to assist cultivators with enrollment, compliance activities, and monitoring and reporting, which gives shy farmers a more anonymous option to comply with the order, he said. Hezekiah Allen, executive director of the Emerald Growers Association, an advocacy group representing medical cannabis cultivators, business owners and patients, said he applauded the rule and was looking forward to working with the board to improve it as it rolls out. He said his members welcome regulation and encourage the state to treat marijuana cultivators like any other farmers. Next month, the Central Valley Regional Water Quality Control Board will take up a similar order to regulate water quality and related actions associated with cannabis cultivation. Still, these regional orders only address marijuana grow sites on private lands. St. John said the NCRWB addresses the environmental impacts from trespass grows on public lands by working with state and federal partners and land management agencies. "Those resources are vastly underfunded," he added. "There is nowhere near the staffing we'd need to address that problem."